It's Day Four of the Blood Letters Hunt and all our super sleuth Peas will be rewarded for their efforts with this fabulous prize from Maxi Gossamer. The prizes just keep getting better and better! Proving this is our best hunt to date. 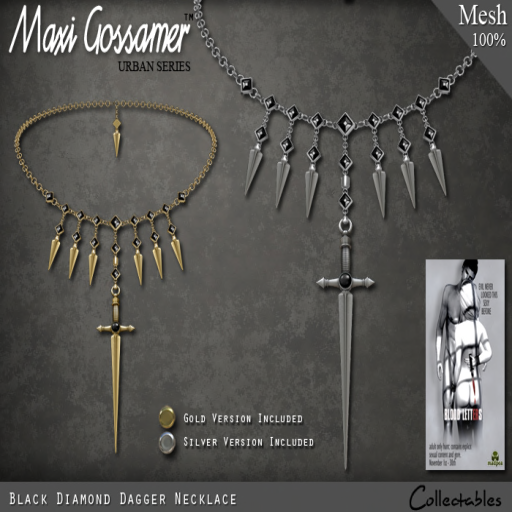 Today you can pick up this amazing, mesh, unisex Diamond Dagger Necklace from Maxi Gossamer. The necklace comes in two versions, gold and silver and as anyone will tell you Maxi Gossamer is known across the grid for the quality of her beautiful and unique mesh jewellery and accessories. Please, please check out the how to play guide before starting on your epic adventure with us. Don't forget this is an adult based hunt with a strong theme of gore and adult related material...you have been warned!